Canara Bank Recruitment for the posts of Probationary Officer has been announced. It is a leading public sector bank and for the students who are looking for attractive bank jobs this is a very good opportunity. Canara Bank has announced recruitment for 800 Probationary Officers post. Therefore it is a very good opportunity as the number of vacancies is very good. In this post I am giving you important details about this recruitment. At the end of the post there are links for official notification and official website which you must also visit before applying. Educational Qualification: A Degree (Graduation) with a minimum of 60% marks (55% for SC/ST/PWBD) or equivalent grade, in any discipline from a University recognised by the Government of India or any equivalent qualification recognized as such by the Central Government. Candidates should also have operating & working knowledge of computer. If they do not have, they must either possess or acquire within 6 months from the date of joining the Bank. Selection Process: The selection process will consist of an online objective test followed by Group Discussion and Personal Interview. Those who get final selection will get admission to Post Graduate Diploma in Banking and Finance (PGDBF). On successful completion of course, candidates would be offered appointment in the Bank as Probationary Officer in Junior Management Grade Scale-I. Salary and Allowances: Pay scale of JMGS-I officer is Rs. 23700 – 980/7 – 30560 – 1145/2 – 32850 – 1310/7 – 42020. Candidates will also get Dearness Allowance, HRA, CCA, Medical Aid, Leave Fare Concession etc. and perquisites like Conveyance, Furniture etc., depending on the place of posting. 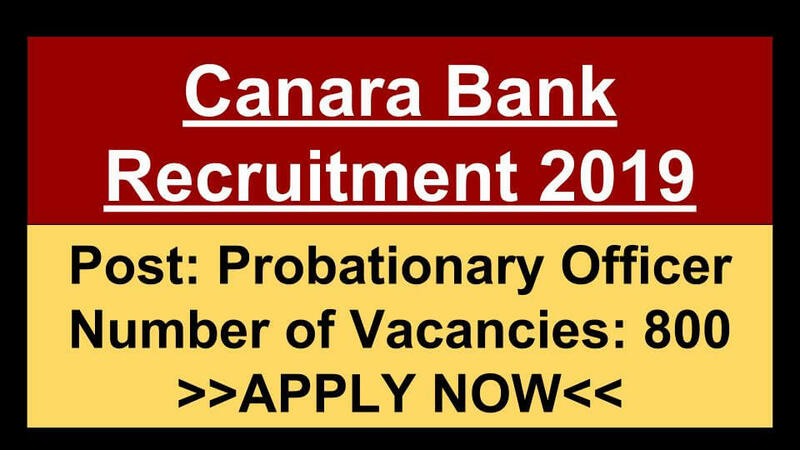 So these were the details about Canara Bank Recruitment for the posts of Probationary Officer. Please go through the official website and official notification for more details.